Aceto is the kind of restaurant worth making a special trip for even if it means a two-hour ride from Kyoto city and an overnight stay somewhere nearby in order to have dinner there (the restaurant does not serve lunch). If you are already visiting Amanohashidate, the pine-covered sandbar considered Japan’s “bridge to heaven” and one of the country’s Three Scenic Views, the ride to the restaurant is a mere 10 minutes. In that case, you should either order a meal plan that excludes dinner at the inn or hotel that you are staying at in order to go to Aceto instead, or you should plan to stay another night. 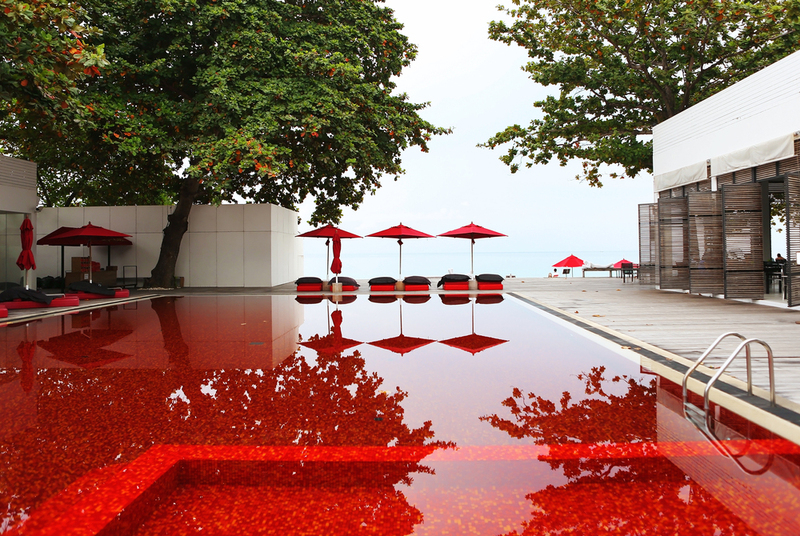 The beauty of Kyoto prefecture’s spectacular Sea of Japan coastline, where Aceto is located, and an absence of the kind of tourist crowds one finds nowadays in Kyoto city support an extended stay in the area. Opened a year ago, Aceto is housed in a handsomely renovated, 120-year-old ochaya (geisha tea house) located in the old entertainment district of the port of Miyazu. A small town, Miyazu is where the Sea of Japan’s beautifully-flavored seafood is brought to be sold at market every morning by local, small-scale fishermen, who ply the sea’s brilliant marine blue waters traditionally and sustainably. They include the fishermen of Ine, who are famous for living in unique boathouse-residences built on stilts over the water, called funaya, and for catching some of the best seafood in Japan. The Sea of Japan teems with seafood, and there are over 1,000 kinds of fish and 900 types of crustaceans. Because the remote sea is pollution-free and mineral-rich, its seafood is delicately soft and pleasurably sweet in summer and luxuriously fat and rich in winter. Much of it is considered best-in-class and has locally-branded names like Ine yellowtail, Taiza crab, and Tango cockles. The diversity and quality of the region’s seafood is the reason Kyoto and Osaka’s plutocrats came to Miyazu-Amanohashidate for their holidays for hundreds of years; more so than for the geisha tea houses, which largely closed their doors 30 years ago. Today Miyazu is becoming more straightforwardly a gastro-destination, and there are a growing number of creative restaurants like Aceto, where you can enjoy the region's delicious seafood. 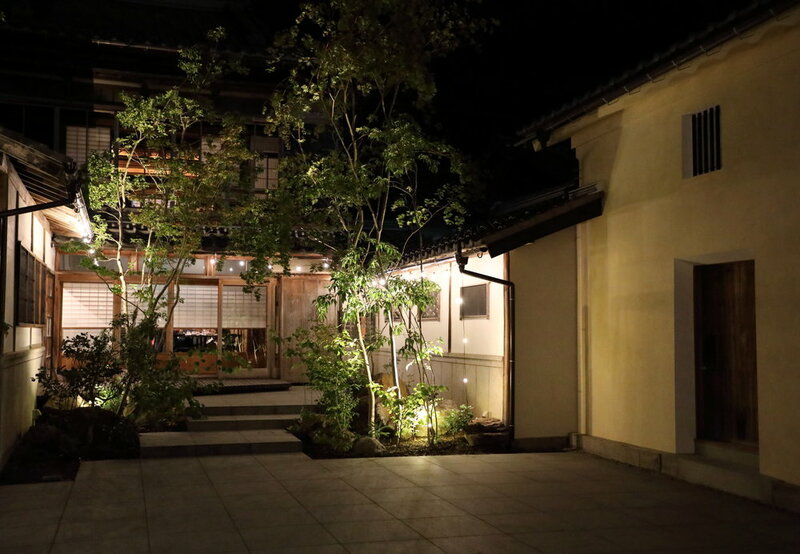 The renovation of the 120 year-old ochaya (geisha tea house), in which Aceto is located, preserved much of the building's old details, including the painted sliding doors in the dining room. Fresh, local seafood selected each morning from the fish market steps away from the restaurant is featured at Aceto, accompanied by organic and naturally-produced other local ingredients. The theme of the restaurant is Italian cooking, specifically Sicilian. Like Japanese cuisine, Italian cooking relies on light cooking techniques and understated seasoning to highlight the natural flavors of its fresh, seasonal ingredients. Sicilian cooking, in turn, is focused on seafood. It is also a blend of the many cuisines brought by conquerors who ruled Sicily at different times over millennia, and is similar to Japanese cooking in its ability to skillfully absorb the best aspects of other culinary traditions and make them into something new, and often something better. That is what chef Yasuhiko Shige, who trained in Sicily and then was head chef at two well-known Sicilian restaurants in Tokyo for many years, is now doing at Aceto through his skillful and creative blending of these two inherently versatile cuisines. 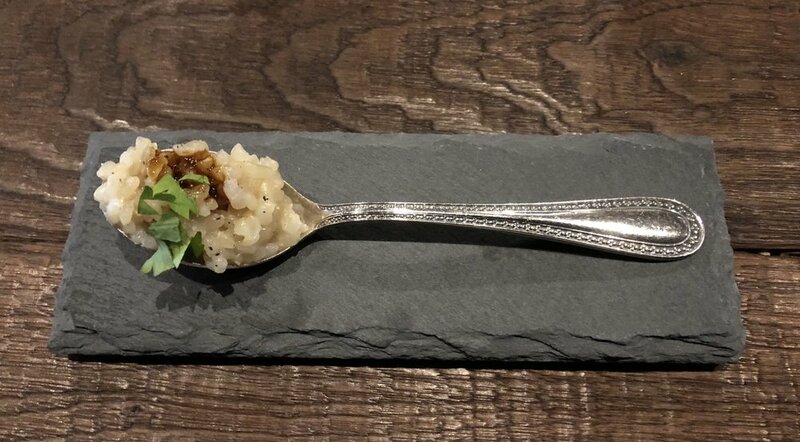 A meal at Aceto starts with a stuzzichino (appetizer) that consists of a spoon of locally-grown, organic brown rice topped with a medley of minced seafood and seasoned only with Parmesan cheese. It is designed to tune your palate to the tastes of the region (rice and seafood being the two main foods produced in the area around Miyazu). Depending on your perspective, the stuzzichino can be viewed as a mouthful of risotto or a piece of sushi set on a spoon and dressed Italian-style, with the tangy Parmesan cheese providing the touch of salty, sweet, umami-rich acidity that soy sauce does for sushi in Japanese cooking. Chef Yasuhiko Shige in the kitchen at Aceto. Take away the spoon and the stuzzichino (appetizer) of locally-grown organic brown rice topped with a minced medley of seafood can look like a piece of sushi, instead of a mouthful of risotto, depending on your perspective. The two main foods produced around Miyazu are seafood and rice. The organic brown rice served at Aceto came from rice fields like these terraced along the spectacular coastline of the nearby Tango Peninsula. 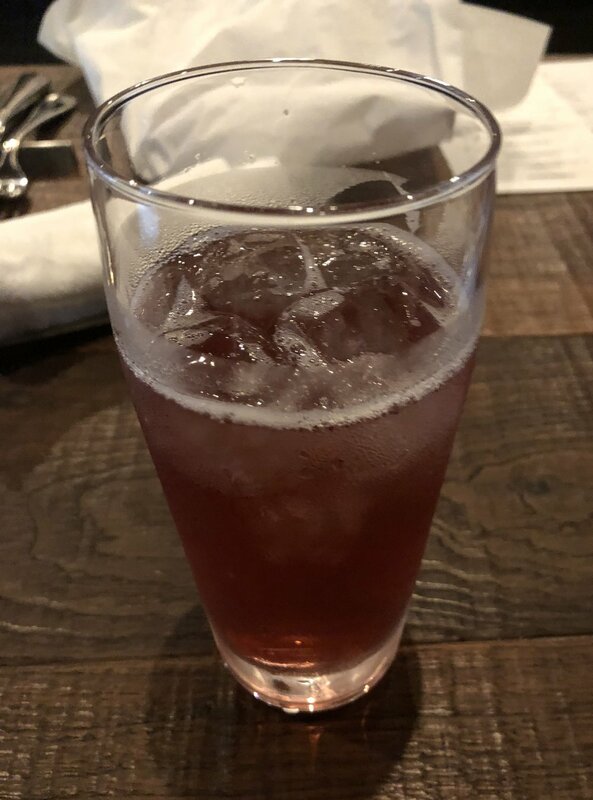 Aceto means vinegar in Italian, and the name of the restaurant is reflected in Yasuhiko's brilliant use of acidic seasonings to subtly showcase the flavors of his fine, fresh ingredients and create delicious, clean-tasting dishes. Sicilian cuisine is built on the addition, and layering, of a diverse range of acidic seasonings and ingredients into its dishes. 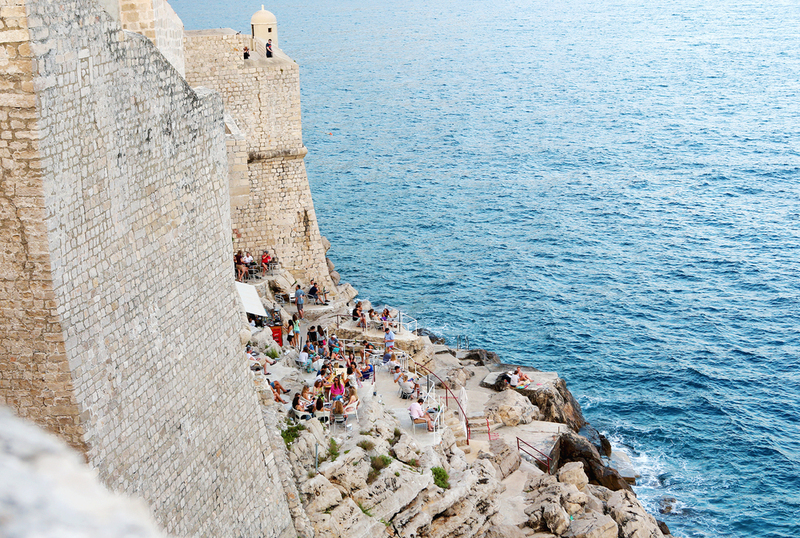 Sicily’s ancient Greek masters taught local cooks how to cook with vinegar and make sweet-sour dishes like caponata. The island’s later rulers included Romans who introduced tangy cheeses, Arabs who planted a diverse range of sour citrus fruit, and the Spanish who brought acidy tomatoes and the French their wine vinegars. Yasuhiko uses all of these acidic seasonings in his cooking as well as the additional Japanese acids of sake, rice, fruit, and vegetable vinegars, and the country's unique varieties of fresh citrus. He chooses from among them depending on the needs of his daily changing menu. Aceto's red sweet potato vinegar and beer cocktail. The transformative power of acidic seasoning is demonstrated at the start of dinner by Aceto's signature beer cocktail. A spoonful of red sweet potato vinegar (beniimosu) is added to a glass of beer, rounding out the bitterness of the beer while making the beer (which itself is a cooking acid in northern European cuisines) more refreshing. The slightly fruity beer cocktail is a delightful way to stimulate the appetite and clean the palate for the meal to come. Acid’s subtle ability to enhance and balance the flavor of foods is evident throughout the course of dinner. On a late summer night, the stuzzichino was followed by Red Rock Fish (kijihata) carpaccio (or sashimi, depending on your perspective again) dressed with a mild Japanese apple vinegar and circled by dabs of a basil sauce, in case you thought any additional flavoring was needed, which wasn't. The apple vinegar brought the fish’s mild flavor and sweetness to life, without a trace of sourness, and further softened its already tender texture. This cold antipasto was followed by a hot antipasto. Grilled baby White Squid (shiro-ika), a late summer delicacy prized for its softness, sweetness, and rich flavor, was stuffed with its own mincemeat and blue-black ink and served on a tomato sauce alongside a mound of caponata made with fig vinegar. The caponata included aka-mai red rice (an ancient, full-flavored heirloom rice) to give it more texture. The dish demonstrated Yasuhiko's ability to create great Sicilian-style food using the best Japanese ingredients, brightening a rich, complex dish with a trio of acidic notes—tomatoes, olives, and fig vinegar. The dabs of basil sauce are more for decoration than flavor, as the Red Rock Fish carpaccio has already been brilliantly seasoned with a mild apple vinegar that highlights the fish's tender sweetness. The rich, complex flavors of stuffed baby White Squid and caponata are clarified and brightened by the three acidic notes of tomatoes, olives, and fig vinegar. The restaurant is owned by Iio Jozo, maker of what many consider to be Japan’s finest artisanal rice vinegar “Fujisu,” as well as a range of other vinegars, including the red sweet potato, apple, and fig vinegars used in the first three dishes. Iio Jozo is a small, family-run brewery that has been making rice vinegar since 1893 in Miyazu. Over forty years ago, the brewery pioneered the use of organic ingredients, which it combines with an all-natural brewing process. To ensure the quality of its products, it performs every step of the vinegar making process itself. It grows its own organic rice (the rice in the stuzzichino), uses that rice to make its own sake, and then brews that sake into rice vinegar. What also makes Iio Jozo's rice vinegar unique is the amount of rice used, much more than other brewers. This gives its rice vinegar a milder flavor and increases its healthy nutrients. Importantly, it also amps up the vinegar's umami. Iio Jozo's red label "Junmai Fujisu" rice vinegar is made with 200 grams of rice per liter vs. 40 grams for standard commercially-produced rice vinegar. Its blue label "Fujisu Premium" rice vinegar is made with 320 grams of rice per liter. Umami-enriched seasonings are the secret to Japanese cooking because they give fresh, seasonal foods a subtle richness. For example, sake, moshio seaweed salt, and soy sauce all pack umami, in addition to their other, primary seasoning qualities. Iio Jozo's rice vinegars fill the role of being an umami-enriched, acidic seasoning. A comparison of the rice content of commercially-made rice vinegar on the far left with Iio Jozo's "Fuji-zu" rice vinegars. The second bottle from the left corresponds to the red label "Junmai Fujisu" rice vinegar and the center bottle corresponds to the blue label "Fujisu Premium" rice vinegar. The first of two pasta dishes was a cold sea urchin (uni) pasta, which is as standard a dish in Japan's repertoire of foods as it is in Sicily. It was made with rich, creamy, and not-at-all-briny sea urchin from Ine Bay. To heighten the clean luxuriousness of the sea urchin, Yasuhiko ingeniously transformed the pasta into a secret seasoning agent. He did this by boiling the pasta in a clear, umami-rich, acidic tomato stock that he had made by cooking, pressing, and filtering tomato juice multiple times, intensifying the tomato juice's natural umami and acidity until the stock had become a complex seasoning. This was then infused into the pasta when cooking it. By preparing the pasta this way, Yasuhiko also lightened the starchiness of the noodles and tightened their texture so that they absorbed less of the pureed sea urchin sauce. The dish was finished with pieces of sea urchin on top. The second pasta of the evening—a hot one—was tagliolini with blue crab, soy beans, and broccoli. This time the pasta was saturated with the sake lees (sake-kasu) from Iio Jozo’s home-made sake. Fermented and aged for 10 years, the umami-packed, velvety sake lees are mildly sweet and malty, and they gave the pasta flavors that echoed those in the other ingredients. The caramel-colored sake lees also gave the tagliolini an earthy brown color. A classic Sicilian and Japanese sea urchin pasta made with exquisite sea urchin from Ine Bay. Tagliolini infused with aged sake lees and tossed with blue crab, soy beans, and broccoli. The two main dishes also contrasted in terms of one being light and one rich and also their use of natural versus fermented acidic seasonings. A fillet of tender, sweet tilefish (amadai, or sweet sea bream, in Japanese) was lightly pan-fried and served in a paprika and aomikan sauce. Aomikan are sour, immature mikan oranges picked before they have ripened to be used as an acidic citrus seasoning for sashimi, sushi, other seafood, and fried foods during late summer when no other citrus are in season in Japan. Their mildly orange flavor is refreshingly welcome during the hot days of late summer, while their slight bitterness balances the strong sweetness of foods harvested at this time of year. The final dish was tagliata made from seared strips of Kyoto wagyu beef and served with roasted eggplant, broccoli, zucchini, and eryngii mushrooms. Meat dishes are regularly included in Sicilian meals thanks to Sicily's Norman and German invaders; in Japan they are included because of the quality of the country's wagyu beef. The beef was marinated for a day in the lees left over from making rice vinegar, called kasu-zu. The reduced sauce for the dish was made with Iio Jozo's "Fujisu Premium" rice vinegar. The trifecta of umami-laden ingredients—beef, vinegar lees, and rice vinegar—leavened by layers of two different types of vinegar acid made this dish a rich, yet light, deeply satisfying savory wonder. Tasting the sauce on its own revealed the secret to this dish; it had depths of earthiness instead of the fruitiness that would have resulted from the usual use of red wine or wine vinegar to make such a sauce. Iio Jozo created Aceto to support the local economy by helping Miyasu reincarnate itself as a gastro-destination. The restaurant is also a way to demonstrate how to cook better using acidic seasonings. Acid is the second most important seasoning after salt in cooking, and when used appropriately, acid can balance and round out foods' flavors or lighten and brighten them, all the while going undetected in a dish. Yet acid's role in cooking is generally not well understood and it is under-utilized as a seasoning in many kitchens. This is true for rice vinegar in Japanese kitchens. Japanese cooks tend to rely on the mild acidity in sake and soy sauce when cooking and citrus as a garnishing acid to finish foods. Rice vinegar is typically used to make pickles and preserve fish (even then, salt is by far the primary preserving agent) and add a sour flavor to dishes (as opposed to season food), such as Chinese-influenced sweet-and-sour dishes and the mandatory sunomono (vinegared) dish whose role is to balance the flavors in a multi-course kaiseki meal. Hana Hamilton, Aceto’s warm and gracious manager, is happy to tell you how each dish uses seasoning acids (she is fluent in English to the benefit of non-Japanese speakers). This is fascinating and educational if you are a dedicated home cook or food fan. Among the things that Hana may tell you is that by properly seasoning foods using Iio Jozo's umami-enriched rice vinegars, there is less need for salt and butter, other fats, and oils to make dishes delicious and satisfying. Her kind assurance that "you can enjoy Aceto's multi-courses menus but won't leave the restaurant with a heavy stomach" was true. She could have added that you will leave Aceto a very happy diner. Aceto's manager Hana Hamilton is a warm and gracious host, who is happy to tell you, in Japanese or English, how the food is prepared and the ways in which the dishes incorporate the wide range of acidic seasonings that are used. The late summer chef's special course meal ended with an incredibly light, fluffy milk panna cotta topped with fig compote and a densely-packed chocolate terrine accompanied by pistachio gelato. A touch of lemon juice added to the panna cotta helped thicken it and also heightened its natural flavor so that it tasted solely of ethereally pure, fresh milk. The natural acidity of chocolate was all that was needed for the terrine, which was a complete food or mini-meal in itself for chocolate lovers. Aceto is housed in a handsomely renovated, 120-year old ochaya (geisha tea house) located in the old entertainment district of the port of Miyazu. Aceto is open only for dinner Wednesday through Sunday from 18:00 to 23:00. To make a reservation, call the restaurant after 13:00 on any day it is open or send an email. There are two small private dining rooms if you want an intimate evening. The restaurant offers three different course meals. There is a 7-course dinner for ¥5,500 that has seafood as its main dish and an 8-course dinner for ¥7,500, which adds a second main dish of meat. The third choice is a chef's special course menu, which consists of nine dishes at a cost of ¥10,000. This course includes cold and hot antipastos, cold and hot pasta dishes, seafood and meat main dishes, and two kinds of dessert in addition to the stuzzichio. The chef's special course meal is a two and a half hour effort, but given the deliciousness of the food, the delightful ambience of the restaurant, and Yasuhiko's particular skill and passion for making desserts, it should be seriously considered. Another special aspect of Aceto is its excellent selection of Sicilian wines. Like its food culture, Sicily's viniculture is ancient and diverse, and the island's wines are made with a variety of grapes in a range of styles from sweet Muscats and fortified Marsalas to new, drier red and white wines, which are being artisanally-produced using organically-grown grapes and traditional fermentation techniques. Aceto showcases these wines by regularly holding collaboration dinners with Sicilian wineries in the restaurant or outside in its magical courtyard. Iio Jozo Brewery is about ten minutes from Miyazu by car. There is a shop at the brewery that sells the full range of the company's vinegars as well as blended sauces that use its vinegar as a base. These include ponzu, sushi vinegar, pickles seasoning, and others. Many stores in Japan sell Iio Jozo's products, and you can also find them abroad, but you won't find as full a range elsewhere. There is also a tasting room at the brewery, and staff there will guide you through the differences between commercially-made rice vinegars and Iio Jozo's vinegar and also between Iio Jozo's rice vinegar (komesu), brown rice vinegar (genmai kurosu), black soy bean vinegar (kuromamesu), and Edo-mae style sushi vinegar (akasu). Iio Jozo's tasting room looks like an alchemist's workshop full of magical elixirs. From left to right: apple vinegar, black soy bean vinegar, and brown rice vinegar. Miyazu is easy to get to from Kyoto. There are trains and express buses from Kyoto Station and the ride takes about 2 hours. The trains and buses continue on to Amanohashidate, in case you want to make that your base in the area. It adds a few more minutes to the ride. You can also go to Miyazu or Amanohashidate from Osaka via train and express bus. By train, you'll need to change at Fukuchiyama. The total ride is also about 2 hours. Miyazu-Amanohashidate has long been a get-away and seaside resort for the citizens of Kyoto and Osaka. It's also a great place for visitors to Japan to stop and catch their breath as its great food, relaxing environment, and choice of many different types of inns and small hotels make it easy to spend a couple of days there. Miyazu-Amanohashidate can also serve as the jumping off point or base to visit the fishing village of Ine and other locations in the Tango Peninsula. The mountain side of the sandbar is called Kasamatsu Park and is jammed with tourists and amusements. The other side, which is where the train and bus stations from Kyoto are located and is called Amanohashidate, is charming and also relatively quiet. It's a small area centered on Chionji Temple, and has the usual kind of lively shops, tea houses, restaurants, and inns found in temple districts. From here, there is a bridge across a canal to the southern end of the sandbar, where you can take walks and bicycle rides, sit under the pine trees, and go swimming in the bay as local residents do in the morning. Near the bridge is a pier that provides boat tours of the bay. Early morning fishermen on Amanohashidate, the pine-covered sandbar known as Japan's "bridge to heaven." Located in the temple district of Amanohashidate, very near to the base of the bridge that brings you to the southern start of the pine-covered sandbar, Wine and Inn Chitose is a destination in itself. The inn is designed for quality and managed for comfort—four large suite rooms in the main building and three in the annex across the road, indoor and outdoor hot baths, and a guest-only lounge partitioned off in the Cafe du Pin a few doors away. Run by the same family as the inn, the cafe is a great place to relax, read, have coffee, tea, or something stronger, and watch the boats go and up down the canal. The inn's excellent restaurant has a French theme, but is really another Japanese restaurant in disguise that features local, seasonal seafood and other dishes. The beautifully preserved, working fishing village of Ine is an hour away from Miyazu-Amanohasidate by car or boat. The source of much of the fine seafood served in Miyazu-Amanohashidate's restaurants, Ine should be included in any trip to the area. Fifteen of Ine's unique homes built on stilts over the water, called funaya, have been turned into guesthouses. An overnight stay in one of them is a chance to enjoy the villlage's enchanting marine world and also have a great, home-cooked seafood meal. The morning's catch being sorted at Ine's hamauri beach market before being distributed to buyers in Miyazu-Amanohashidate. Breakfast at Kagyiya funaya guesthouses in Ine is a whole, plump, juicy red snapper (tai) that has been encased in a salt crust and roasted. Host Mine Kagi says that returning guests always want to make sure this dish is on the morning menu.